Can Sea Buckthorn Skin Creams Make a Difference? Sea buckthorn (Hipphophae rhamnoides) is a medicinal plant long used in herbal medicine. Sea buckthorn fruit is sometimes used in sweet treats including jams, pies, and drinks. Available in supplement form, sea buckthorn extract contains a variety of essential fatty acids and antioxidants (including vitamin C, vitamin E, and anthocyanins). Proponents claim that sea buckthorn offers a wide range of health benefits. 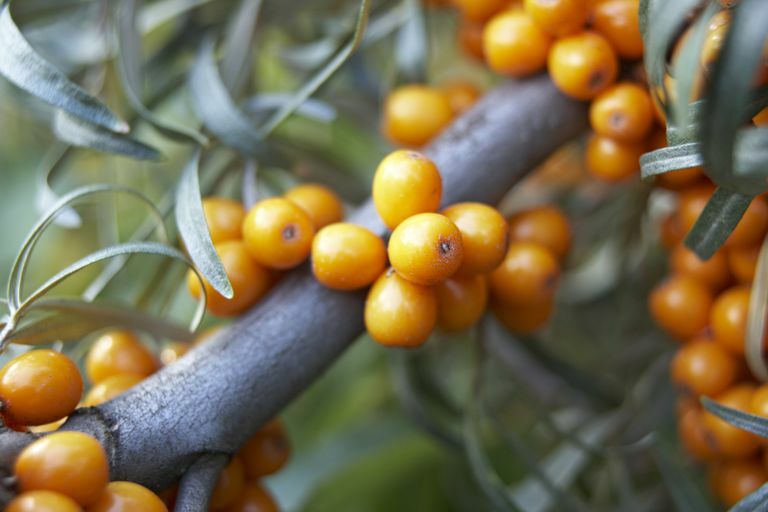 In recent years, sea buckthorn oil has gained popularity as an ingredient in skin-care products. When applied topically, sea buckthorn oil is thought to moisturize the skin, ease irritation, treat acne and heal aging-related damage. There is currently a lack of clinical trials testing the effects of sea buckthorn. However, preliminary research suggests that sea buckthorn may offer a number of health benefits. Sea buckthorn supplements may help treat atopic dermatitis (a type of eczema), according to a 1999 study in the Journal of Nutritional Biochemistry. In tests on 49 people with atopic dermatitis, researchers observed significant improvement among those who took supplements containing sea buckthorn pulp oil every day for four months. In a small 2010 study in the European Journal of Clinical Nutrition, researchers found that sea buckthorn may help keep blood sugar in check and protect against type 2 diabetes. In an experiment involving 10 healthy, normal-weight volunteers, the study's authors discovered that adding sea buckthorn berries to meals helped prevent a post-meal spike in blood sugar. Sea buckthorn fruit is likely safe when consumed in amounts typically found in food. The fruit is also likely safe when taken by mouth for medicinal purposes. But little is known about the safety of consuming sea buckthorn extract. Therefore, it's important to consult your physician if you're considering the use of sea buckthorn supplements. Patients with low blood pressure, bleeding disorders, or those about to undergo surgery should be especially careful to get medical advice before using sea buckthorn. It's important to keep in mind that supplements haven't been tested for safety and dietary supplements are largely unregulated. In some cases, the product may deliver doses that differ from the specified amount for each herb. In other cases, the product may be contaminated with other substances such as metals. Also, the safety of supplements in pregnant women, nursing mothers, children, and those with medical conditions or who are taking medications has not been established. You can get further tips on using supplements. There is not enough scientific evidence about sea buckthorn to determine a safe or effective dose. The right dose for you will depend on a variety of factors including your age, gender, and medical health. Available online, sea buckthorn supplements are sold in some natural-food stores. In addition, skin-care products containing sea buckthorn can be found in many specialty beauty shops. Sea buckthorn may be sold as an oil, in capsule form, or as a capsule combined with other herbal remedies. The National Institutes of Health advises all supplement users to examine Supplement Facts label on any product that you consider using. This label will contain vital information including the amount of active ingredients per serving, and if other ingredients have been added. In addition, it is helpful to look for a third-party seal of approval by an independent organization. Groups like the U.S. Pharmacopeia, ConsumerLab.com, and NSF International help provide verification that the product was properly manufactured, contains the ingredients listed on the label, and does not contain harmful levels of contaminants A seal of approval from one of these organizations does not guarantee the product's safety or effectiveness. Given the lack of supporting research, it's too soon to recommend sea buckthorn for any health condition. It's important to note that self-treating a condition with sea buckthorn and avoiding or delaying standard care may have serious health consequences. Can I grow my own sea buckthorn? Yes, sea buckthorn plants are commonly sold online and in plant stores. The tree can grow in full sun in most areas of the country. How do I cook with sea buckthorn? You can eat these berries right off the tree or cook with them like you would bake or cook with other berries. The berries can also be squeezed and the juice can be added to beverages. Gupta A, Kumar R, Pal K, Singh V, Banerjee PK, Sawhney RC. "Influence of Sea Buckthorn (Hippophae Rhamnoides L.) Flavone on Dermal Wound Healing in Rats." Mol Cell Biochem. 2006 Oct;290(1-2):193-8. Lehtonen HM, Järvinen R, Linderborg K, Viitanen M, Venojärvi M, Alanko H, Kallio H. "Postprandial Hyperglycemiaand Insulin Response Are Affected by Sea Buckthorn (Hippophaë Rhamnoides Ssp. Turkestanica) Berry and Its Ethanol-Soluble Metabolites." Eur J Clin Nutr. 2010 Dec;64(12):1465-71. Sabir SM, Maqsood H, Hayat I, Khan MQ, Khaliq A. "Elemental and Nutritional Analysis of Sea Buckthorn (Hippophae Rhamnoides Ssp. Turkestanica) Berries of Pakistani Origin. " J Med Food. 2005 Winter;8(4):518-22. Suryakumar G, Gupta A. "Medicinal and Therapeutic Potential of Sea Buckthorn (Hippophae rhamnoides L.)." J Ethnopharmacol. 2011 Nov 18;138(2):268-78. Upadhyay NK, Kumar MS, Gupta A. "Antioxidant, Cytoprotective and Antibacterial Effects of Sea Buckthorn (Hippophae Rhamnoides L.) Leaves" Food Chem Toxicol. 2010 Dec;48(12):3443-8. Upadhyay NK, Kumar R, Mandotra SK, Meena RN, Siddiqui MS, Sawhney RC, Gupta A. "Safety and Healing Efficacy of Sea Buckthorn (Hippophae Rhamnoides L.) Seed Oil on Burn Wounds in Rats. " Food Chem Toxicol. 2009 Jun;47(6):1146-53. Yang B, Kalimo KO, Mattila LM, Kallio SE, Katajisto JK, Peltola OJ, Kallio HP. "Effects of Dietary Supplementation With Sea Buckthorn (Hippophaë Rhamnoides) Seed and Pulp Oils on Atopic Dermatitis. " J Nutr Biochem. 1999 Nov;10(11):622-30. Yang B, Kallio HP. "Fatty Acid Composition of Lipids in Sea Buckthorn (Hippophaë Rhamnoides L.) Berries of Different Origins. " J Agric Food Chem. 2001 Apr;49(4):1939-47.